300 miles. A long walk. But not to freedom. Ray Mears recent series about the landscapes of the Wild West on BBC4 finished up the other night with a quite extraordinary tale. Just one of many in fact throughout the three episodes, both settlers and natives encountering all sorts of trials and tribulations thrown at them by the diverse nature of the America's. The Donner Party for instance encountering untold problems and dealing with them in totally unforeseen ways. The story in the last episode however ties in nicely with something I had been planning to do. The Long Walk Of The Navajo as described in the Ray Mears programme has to be one of the longest death marches in history. 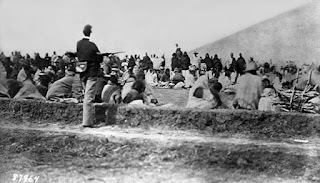 If the men of Jarrow had their caps at a dignified angle by the end of their march, empty of stomach but still upright, the Navajo certainly kept their heads in an equally proud position by the time the trek ended for them. Which for a lot of them was at all points during the trek. Permanently. Spirit can be hard to crush though. Yet again, Bernie's essential reference's of US history have to be taken into consideration. Relative to this, Indian Sunset is the most well known both inside and outside the Elton world. But that's only one scene, one tale in a far larger series of events chains. A decade or so later and he would revisit that theme, with a greater sense of anger, a damning testimony and the only verdict to be arrived at. Before I go on we have to look at how Bernie's chastising unfortunately got lost due to people's Ego's and humours. Like another classic American song from the same era, White Man Danger ended up following The Retreat; consigned to the underbelly of an underselling single. Ignominious at best, a disgrace at worst. J'accuse David Geffen yet again. One day he will have to be brought to book (especially to explain this period) for his machinations that nearly dealt a fatal blow to Elton's recording career. Without going into all the details of it again, this piece here explains it nicely. To recap, the 1980 album by Elton with the correct tracklisting, especially if it had been a single disc could, nay would have propelled Elton back to the top of the album charts. Instead the harder edged songs, both lyrically and soundwise were ditched for a more sweeter flavour. Bad for teeth and ears. Alas, the chance was lost and the quality material that emanated out of the south of France was left to wither on the vine. Not a good recommendation coming from that part of the world. Anyway, back to now. Bernie is always at his best when rugby tackling the serious issues head on. Unflinching here, he takes out both legs of his opponent. The team in the white shirts. If American Triangle was non partisan, there's no doubting about the colours being nailed here and to what. Bernie's opinionated and justly offered view is atypical of his output over the last 50 years. His early detached, latterly deeply involved insights on many related issues hopefully will be evident on the new album. Whenever that will that be...I must check my piece of string. Clocking in at over five minutes, it's not lyrically abundant like Indian Sunset but it's short and direct like an arrow flying through the air. And like said arrow it's impact when it hits the target dead on is brutal. Inflammatory in concept, incendiary in description and condemning of his own white race. Just let that idea sink in. The pure uniqueness of it. The setup of the tome is simple, two protagonists in each corner. In the white corner the 'White Man' shadow boxing with certainty of victory. Might is right being his motto, 'he feels no pain'. In the red corner, the 'Red Man' with 'slim chance and none' being equally certain of victory. The victory of the spirit. In one movement Bernie executes a trial and judgement with the sentence being shame. Unlike some of his other explorations of that vast landscape, this time he employs no use of visual imagery. Lakes, canyons, rivers, plains, mountains or oceans are not needed as extras. Just the representation of two sides, one just, the other powerful. No contest. His taut words sum up the simple premise, extermination may be an exaggeration but to others it may be an undervaluation. The 'White Man' is here and not going away. The 'Red Man' was here but he can stay. But only where and when he's told. Elton does an incredible job here, from his production outwards. He crafts the music perfect to the lyric with sharpness and directness. The melody is unrelenting once proceedings get underway. His vocal is totally unaffected (the best way) throughout, phrasing precise and decisive. The harmony vocals from the girls adding an extra sense of importance to the chorus. 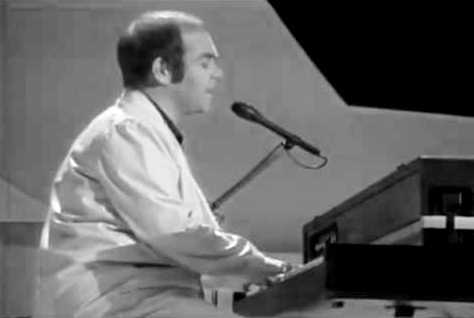 Putting aside the acoustic piano, and leading with one of his trademark sounds of the era, the electric piano, is the correct choice here. It's sharp, glary sound ideal to cut through the heavy sound. The rhythm section of Alvin Taylor and Reggie McBride being one the best studio drum and bass combos he's ever used outside of the best. The drums in particular are huge, the heaviest sound he's used up to that point. In front of that is Steve Lukather's guitar sound; initially like a spaceship coming into land in the desert at the start, circa 1947. Bang on the beat throughout after it lands, it's throbbing, darting sound coupled with that powerful backbeat has slight undertones of new wave. The best influence of 1979 to have been soaked in...the thought's of disco creeping in beyond Victim Of Love too scary to contemplate. The Hammond solo by James Newton Howard with his speedy hand sweeps across the keys adding an almost swinging break in the middle. It's a welcome intervention, musically more interesting at this time in the song than a guitar solo would have been. Again another gem from the arsenal of Elton and Bernie that for too long has been filed under the b-sides category to gather dust. There has to be a revisionist look at the back catalogue one day as too much of the really vital material has been left dormant and devoid of the lavish praise it's entitled to. Incredible to think this song has never been released in a digital format officially for instance. I've said it before and I'll say it again, Elton has probably the best catalogue of any late 20th/early 21st Century artist but the worst treatment of it. In terms of what has been released, the structure of it, the final makeup of compilations and formats.